An important time of year for all fly-fishing enthusiasts is here on the Adirondack Coast…the Salmon Run season. Every year, from mid-April to the end of May, hundreds of Salmon return to the many rivers that empty into Lake Champlain and make for a fly fisherman’s (or woman’s) dream. 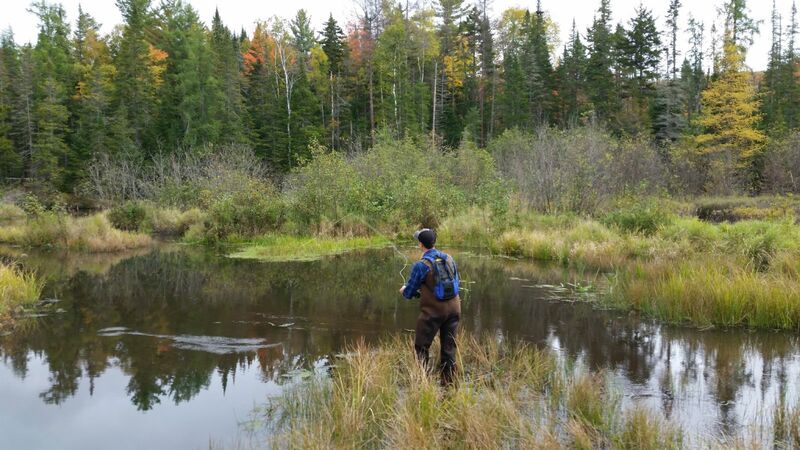 Fly-fishing is a common activity in the Adirondacks—a peaceful way to enjoy the beautiful scenery and an opportunity to hook some other native upstream residents such as the rainbow or brook trout. Come along with me and meet three fly-fishing enthusiasts telling us some tips, tricks and stories from their fly-fishing adventures on the Adirodack Coast. Visit one of our local fly shops and taking advantage of some of the local fly-fishing guides. While talking, Mike recounted a memorable fishing story with a smirk. Scared by a large noise behind them, Mike and his friend made a speedy getaway across a beaver dam while simultaneously lugging fishing waders, gear, and rods. What they thought was the sound of a much larger animal (perhaps a bear or moose) trekking through the forest, was actually a deer that was – if you believe it - more afraid of them than they were of it. 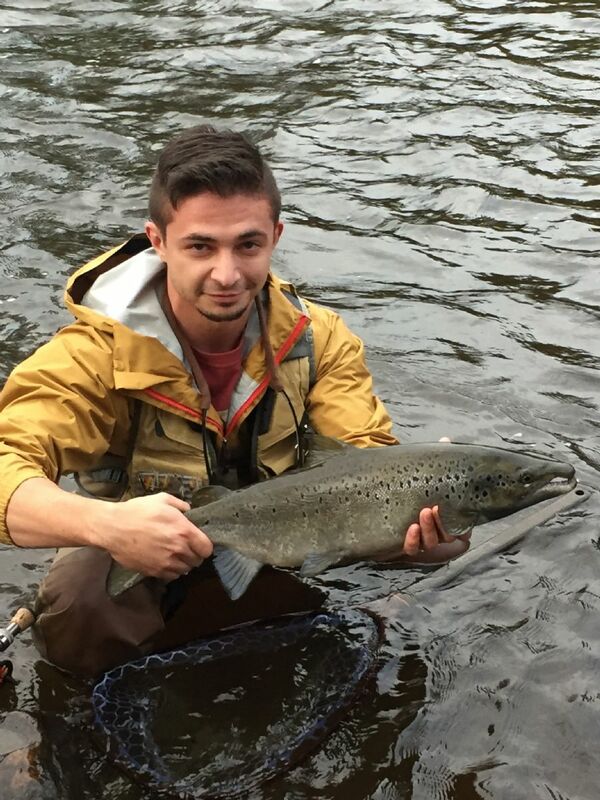 John's son, Joey, with a landlocked Salmon from the Saranac River. John Bernardi, an Adirondack Coast resident, has been fly-fishing for well over 30 years and had plenty of great advice for beginner anglers, as well as some insights into his favorite fishing holes (spoiler alert: along the Saranac River in Plattsburgh and along the Bouquet River in Willsboro). He also helped to educate me a bit on Salmon, who I found, are the most incredible fish. They make the difficult journey upriver in the Spring and Fall. A common misconception is that the Salmon return upriver to spawn in the Spring when, in fact, this is the time they return to feed on smaller bait fish, while Fall is the time they return upstream to breed in the cold running waters of our rivers. Landlocked Salmon happen to be John’s favorite species to fish, so he is a regular Salmon-run goer and has plenty of stories about his experiences to share. 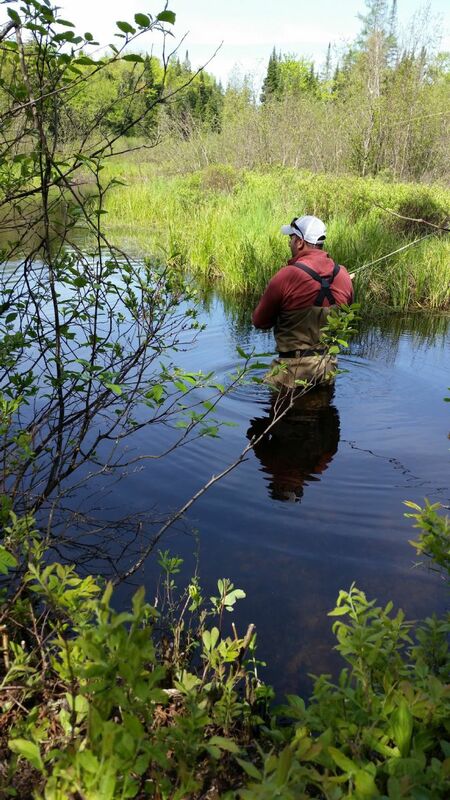 Like Mike’s deer story, John has also heard and seen his fair share of wildlife while fishing in the Adirondacks. However, unlike Mike’s story, what he thought might be a deer out of the corner of his eye was actually a mother bear and her two cubs making their way across the river right in front of him. Remaining still, the bears did not spot him, so he was able to experience Adirondack wildlife in its purest, natural form – something that “frightened, yet exhilarated” him. The most important thing to remember when fly-fishing, John says, is that “presentation is key”. This means that the way the fly is presented to the fish is more important than the fly itself. 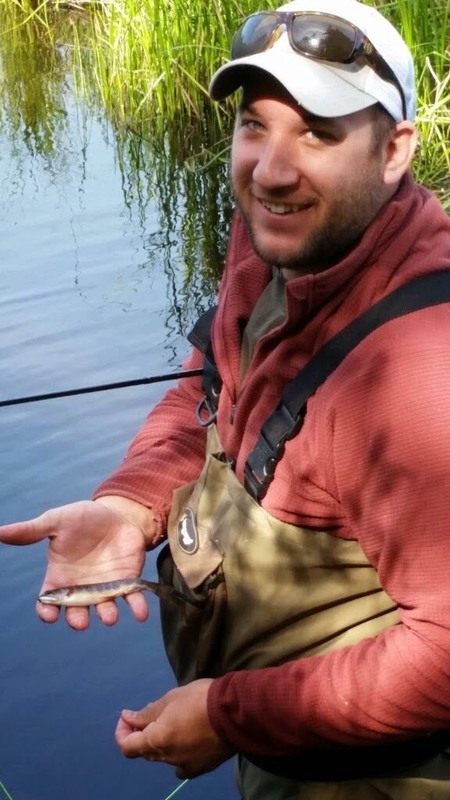 Amateur anglers need to understand that in order for the fish to approach or take the bait, the bait must look natural to those surroundings, like something that the fish would normally eat. Always remember to be safe. Bring proper gear and be a responsible angler. “Always let someone know when you’re going and when you plan on coming back,” which is especially important when you plan on fishing alone. John is proof that fly-fishing is more than just a sport—it’s a way of life. 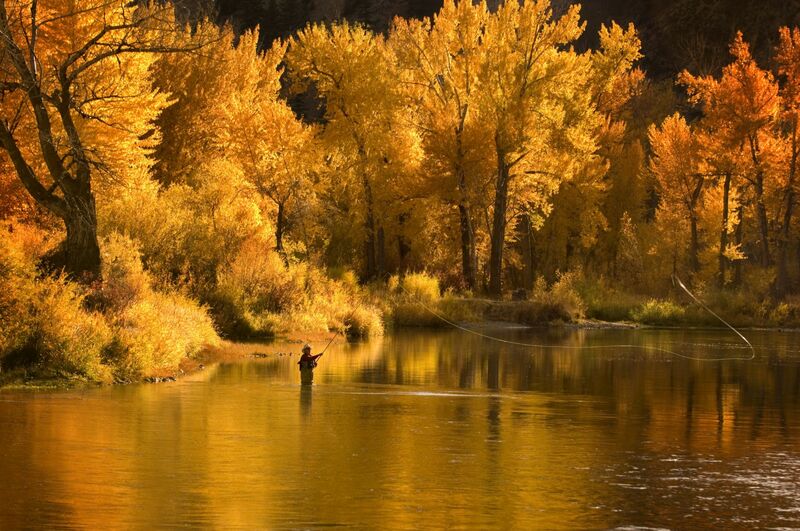 "Fly-fishing is a journey through a moment in time and a lifetime of moments. It takes you to places, both real and imagined, where the soul and senses combine to form the perfect destination." Garrett Lemza is an amateur fly-fisher of 3 years, but has been traditional spin fishing for as long as he can remember. The 16 year old first experienced fly-fishing with an elderly friend took him out and then recommended that he read the book “All Fisherman are Liars”- since then, he has been hooked (pun intended). When asked about his favorite catch, Garrett said that he is still “fairly new to the fly-fishing game, so his very first catch on a fly-fishing rod is still [his] most memorable!” At the moment, he is a multi-species angler, meaning he is not geared towards catching any specific type of fish. A reasonable tip to keep in mind is that a lot of gear is available for fly-fishing, but the amount of gear doesn’t make one angler better at the sport than another. Do a fair amount of research about how to catch Salmon before trying it cold turkey. As with almost every sport, the more you know about it the better you will become. Don’t be disappointed when you don’t catch anything. Patience is key when it comes to fishing – enjoy it! Garrett’s favorite fly-fishing tale is when he accidentally angered an overly large beaver who then decided to charge toward him. He had to quickly run out of the pond in full gear to avoid being hurt (side note: another tip that I will add after hearing three stories from anglers, be observant in your surroundings and prepared for wildlife – remember this is their home and you are simply a visitor, so take all precautions). Thank you to Mike, John and Garrett for sharing your fly-fishing tips, tricks and stories! It was so great getting an insider’s view on this amazing sport that is becoming more and more popular for all ages throughout the Adirondack Coast..
Meet Emelia Lemza, Emmy for short! She is a 14 year old student at Peru High School and has lived in Plattsburgh, NY all of her life. She loves the area for its many local businesses, the friendly people in the community and, of course, the beautiful Lake Champlain. You will find Emmy on the water most of the summer waterskiing, kneeboarding, jetskiing, taking photos and exploring the hidden gems Lake Champlain has to offer. Oh and when she is not on the water, you can find her baking and eating just about anything with Nutella!